• Recognise common capacitor types and their uses. 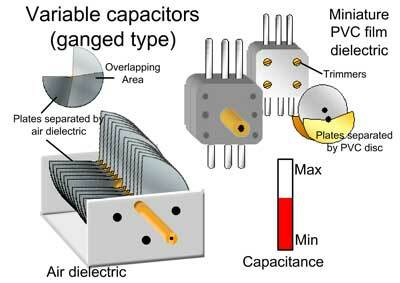 Capacitors (and inductors) have the ability to store electrical energy, inductors store energy as a magnetic field around the component, but the capacitor stores electrical energy as an ELECTROSTATIC FIELD, which is created between two thin sheets of metal called "plates" that each have a different electrical potential (or voltage). Fig 2.1.1 shows the UK and US circuit symbols for a variety of capacitor types. A basic fixed value type of capacitor consists of two plates made from metallic foil, that are separated by an insulator. This may be made from a choice of different insulating materials, having good DIELECTRIC properties. 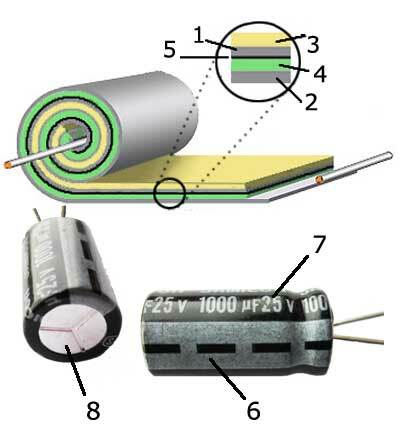 Some basic types of capacitor construction are shown in fig 2.1.2a. High Voltage Electrolytic used in power supplies. Axial Electrolytic; lower voltage smaller size for general purpose where large capacitance values are needed. High Voltage disk ceramic; small size and capacitance value, excellent tolerance characteristics. Metalised Polypropylene; small size for values up to around 2µF good reliability. Sub−miniature Multi layer ceramic chip (surface mount) capacitor. relatively high capacitance for size achieved by multiple layers. Effectively several capacitors in parallel. The construction of non−polarized capacitors follows a similar pattern over many types. Variations consist in the area of the plates and type of dielectric material used for a given capacitance; ideally the dielectric chosen for any capacitor fulfil three basic criteria. 1. It will be as thin as possible, because capacitance is inversely proportional to the distance between the plates. 2. The permitivity of the material will be as high as possible, as permitivity directly affects the efficiency of the dielectric. 3. The dielectric strength must be sufficient to withstand the required voltage rating of the capacitor. 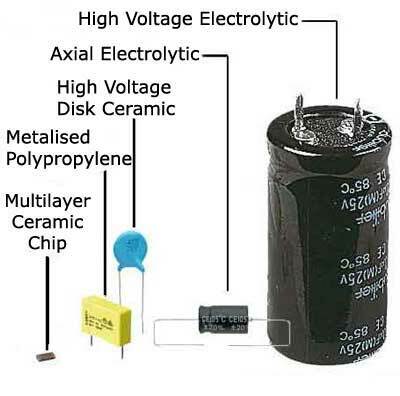 Each of the basic capacitor types shown in Fig 2.1.3 (apart from the miniature ceramic chip types) will be coated with an insulating layer (often an epoxy resin). 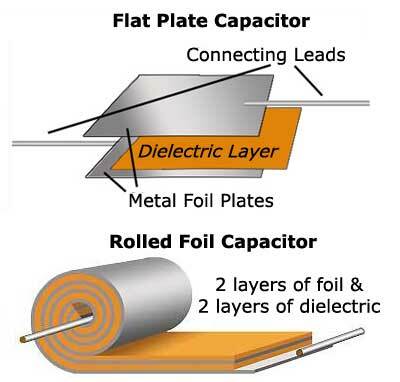 The construction of electrolytic capacitors is similar in some ways to a rolled foil capacitor. Except that, as shown in Fig. 2.1.4 the layers between the foil are now two very thin layers of paper, one that forms an insulator(3) separating the rolled pairs of layers and the other, a layer of tissue(4) between the positive(1) and negative(2) foil plates, soaked in an electrolyte that makes the tissue conductive! It would seem from the previous paragraph that the soaked tissue places a short circuit between the plates. But the real dielectric layer is created after construction is complete, in a process called "Forming". A current is passed through the capacitor, and the action of the electrolyte causes a very thin layer of aluminium oxide(5) to build up on the positive plate. It is this extremely thin layer that is used as the insulating dielectric. This provides the capacitor with a very efficient dielectric, giving capacitance values many hundreds times greater than is possible with a conventional plastic film capacitor of a similar physical size. The down side with this process is that the capacitor is polarised and must not have reversed polarity voltages applied. If this occurs the insulating oxide layer is very quickly stripped away from the positive plate, allowing the capacitor to pass a large current. As this occurs in a sealed container, the "liquid" electrolyte quickly boils and expands rapidly. This can lead to a violent explosion within seconds! NEVER connect an electrolytic capacitor the wrong way round! Because of this danger, electrolytic capacitors have markings showing the polarity of their connecting leads. A common polarity marking(6) is shown in Fig. 2.1.4 consisting of a strip of minus(-) symbols to indicate the negative lead of the capacitor. Notice also that the end of the capacitor has three grooves to provide a weak point in the sealed case, so that in the event of an explosion, the top of the case will fail, hopefully minimising damage to surrounding components. All capacitors, whatever their type, also have a maximum safe working voltage (Vwkg). If the voltage marked on the capacitor(7) is exceeded there is a high risk that the insulation of the dielectric layer separating the two plates will break down and cause a short circuit between the plates, this can also cause rapid and extreme overheating resulting in a possible explosion. Fig 2.1.5 Ganged Variable capacitors. The variable capacitors shown in fig. 2.1.5 are used as tuning capacitors in AM radios, although they have largely been replaced by "Varicap" (variable capacitance) diodes having a small capacitance that can be varied by applying a variable voltage. but the mechanically variable capacitors can still be found in circuit diagrams and supplier´s catalogues for replacement purposes. Tuning capacitors, whatever their type, generally have very small capacitance values of typically a few pF to a few tens of pF. Large air dielectric types like the animated one in Fig. 2.1.5 have been superceded by miniature PVC dielectric types as shown top−right of Fig 2.1.5. The front and back views show the tiny preset or trimmer capacitors accessed through holes in the rear of the case). Symbols for variable capacitors are given in fig 2.1.6. Variable capacitors are often available as GANGED components. Usually two variable capacitors are adjusted by a single control spindle. The arrow symbol indicates a variable capacitor (adjustable by the equipment user, and the T shaped diagonal indicates a preset capacitor, for technician adjustment only. The dotted line connecting a pair of variable capacitors indicates that they are ganged. These small preset capacitors are available in a variety of very small designs, and work in a similar way to the larger variables, with tiny rotating plates and typically PVC film dielectric layers between. Their capacitance is only a few pico farads and they are often used in conjunction with larger variable capacitors (and even fitted inside the case of tuning capacitors) to improve accuracy.